Here are meditations that prepare everyone to encounter Christ and have a renewing Communion experience! 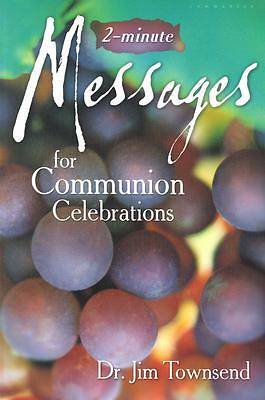 Whether you celebrate Communion once a week or once a month, Two-Minute Messages is a full supply of brief Communion meditations to last for years. Jim Townsend's in-depth knowledge and experience provide 100 Communion meditations that explore the wonder of this event in an insightful--and concise--way.